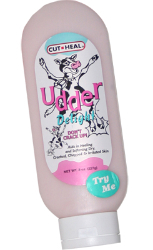 Udder Delight quickly matches your skin temperature and chemistry and penetrates leaving no greasy, sticky, residue. Most people will achieve 7-10 hours of protection with one application, even if they wash their skin. Most importantly Udder Delight aids in healing skin that is excessively dry, creating smooth, pliable skin. Don't Crack Up!